Transcription – loudlatinlaughing – Euge! Euge! Floating away into the dream world of Kate Atkinson is always a treat. 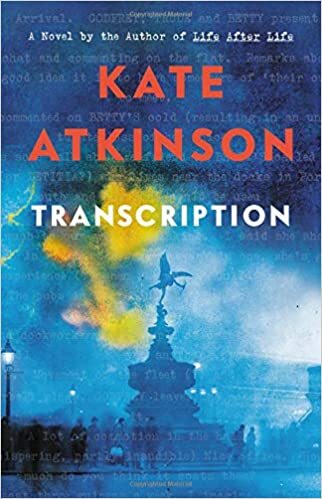 Her forte seems to be the world of 1940s and 50s London, and in this novel she recruits her narrator from a secretarial spy who dutifully transcribes the recordings made of conversations next door to her office. A colleague poses as a Gestapo informant and gleeful housewives fall upon him in a frenzy to get invisible ink and plot their petty treasons against the Crown. Against this backdrop, we’re pushed into the 1950s, post-war, Juliet is working for the BBC now after a stint in Manchester. She’s a bit more weary, worldly, than her 18-year old self. People from the war keep popping up, and she gets a note that rattles her telling her she’ll pay for what she did (which was to accidentally murder one of the housewives gushing to her Gestapo connection). It’s a bit flimsy, but Atkinson can write well and carries it off.